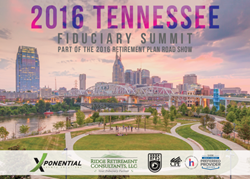 Xponential Growth Solutions and Ridge Retirement Consultants, LLC announce the Tennessee Fiduciary Summit, on April 20, 2016 at the Nashville City Club. The summit is part of the Retirement Plan Road Show: a national series of educational workshops designed for 401(k), 403(b), and retirement plan sponsors, trustees, and fiduciaries. It’s more difficult than ever to be a plan sponsor and know how to best mitigate your fiduciary liability while at the same time offer a retirement plan to your participants that actually gives them the ability to be able to retire. The 2016 Tennessee Fiduciary Summit is a workshop bringing together both local and national expertise to interact with employers made up of executives in Finance, Human Resources and Benefits, as well as Business Owners. Speakers will provide insights to help employers reduce fiduciary risk, identify plan upgrades, and make better decisions that positively impact participants. Ridge is an independent Registered Investment Advisor providing retirement plan consulting to plan sponsors and their participants. With an extensive and unique background in the retirement plan industry, Ridge brings innovative solutions that drive meaningful impact for their clients. With a client base that ranges in size from start-ups to plans of over a billion dollars and plan types of 401(k), 403(b), defined benefit and non-qualified we have the ability and expertise to provide comprehensive consulting to plans of all types. Xponential Growth Solutions (XGS) unites 401(k), 403(b) and retirement plan sponsors with elite resources and exclusive connections. Through research, fiduciary summits, and industry expertise, they help the nation’s retirement plan sponsors, fiduciaries, and trustees evaluate their plan and navigate the retirement plan industry. Working to help America reach their retirement goals one retirement plan at a time, XGS also founded the Retirement Plan Roadshow, a national series of fiduciary educational summits dedicated to human resources, finance and business professionals in charge of America's 401(k), 403(b), and retirement plans.